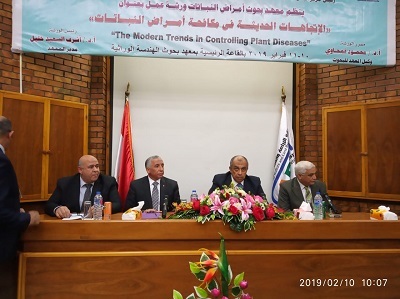 Minister of Agriculture and Land Reclamation Dr. Azzedeen Abusett inaugurated the workshop organized by the Plant Pathology Research Institute of the Agricultural Research Center under the title "Modern Trends in the Control of Plant Diseases". The Minister of Agriculture said during his speech that the Agricultural Research Center is witnessing a scientific and practical renaissance in the agricultural sector, both vegetative and animal, through the development of applied research to cover production as well as to try to reduce the food gap and access to self-sufficiency as much as possible, The technical guidance which reaches the farmer to promote the national production of Egypt and increase its agricultural export within the framework of the national program of President Abdul Fattah al-Sisi, President of the Republic. Abustit stressed the importance of the workshop organized by the center where it aims to use modern and advanced technologies in the field of plant disease control. He pointed out that the plant diseases research institute has an important role in producing strategic crop varieties resistant to plant diseases whether field or horticultural in cooperation with research institutes To reduce the spread of these diseases in an epidemiological manner and to minimize the losses by cooperating with the Central Department of Quarantine to prevent the introduction and spread of new plant diseases. The Minister of Agriculture pointed out that no one can overlook the role of the Agricultural Research Center and its recommendations to farmers to take the best processes and agricultural transactions to raise national production through the establishment of training courses and field guidance seminars and participate in national campaigns. For his part, Dr. Mohamed Soliman, head of the Agricultural Research Center, said that the Plant Pathology Research Institute is one of the most important research institutes within the Agricultural Research Center. It has many achievements, the most important of which are the prediction of disease rates and prevalence and the comprehensive inventory of pathogens under climate change conditions. And to identify the most important strategies to reduce losses resulting in increasing the productivity of the crop in quantity and quality, as well as the use of alternative and safe ways to control plant diseases substitute for chemical pesticides because of their harmful effects on health Humans, animals, plants and the environment and then the transfer of technology to farmers and investors through agricultural extension campaigns and field trials. Sulaiman pointed out that the workshop will develop optimal and effective solutions to combat pathogenic pathogens through some axes, which are chemical pesticides and their role in combating pathogens and diagnosis and definition of pathogens in modern ways so that specialists can characterize pathogens in a correct scientific manner and then develop optimal solutions for control. The workshop also addresses the role of nanotechnology as a modern trend in the control of plant diseases. Dr. Ashraf Khalil, director of the Institute of Plant Pathology Research, said that the Institute is one of the oldest and oldest research institutes and one of the main wings of the Agricultural Research Center. It is one of the most important pillars of applied research and guidance in the field of Egyptian agriculture. The Institute aims to protect plant production from pathogens affecting Reduce the quantity and quantity of production by stopping the pathogenesis of pathogens that are prohibited from entering our beloved Egypt through external agricultural quarantine in cooperation with the Central Department of Quarantine or using the latest applied scientific techniques used in the control, Yeh or biological or chemical safe with the use of early warning system to predict disease or using the latest techniques of nanotechnology and advanced materials. Or through the production of disease-resistant plant varieties in cooperation with relevant research institutes. Khalil pointed out that the institute relies on the latest technology in diagnosis, identification and control, with emphasis on safe biochemical and chemical pesticides and the development of disease resistant plant varieties. The institute also contributes to the opening of new export foreign markets through the export of field crops and horticultural free of prohibited pathogens. On the sidelines of the workshop, the Minister of Agriculture honored a number of professors and scientists of the Institute of Plant Pathology Research, who held high positions in the Ministry of Agriculture, namely: Dr. Salah Abdel-Momen, former Minister of Agriculture, Dr. Salah Youssef, former Minister of Agriculture, Dr. Safwat El Haddad, Chalabi, the agricultural cultural advisor in Rome, as well as the recently awarded State Institute scientists.